Rockin' in the new Year at Run For Young. The event includes a USATF Certified, flat 5K course in downtown Raleigh with live music along the way. The 12th annual Run For Young includes a USATF Certified, flat out-and-back 5K course in downtown Raleigh with live music along the way. Planned and managed by Christ Church youth, Triangle community members of all ages are invited to run or walk the route down Edenton and Hillsborough Streets, and strollers are welcome. Run For Young has been chosen as the first of the 2019 Triangle Race Series. The race honors the memory of Sadiki Young, a Christ Church member and acolyte, who was a senior at Wakefield High School when he died as the passenger in an alcohol-related accident in 2007. In 2008 the Run for Young was founded by Christ Church youth as a way to both honor the memory of Sadiki and raise awareness of safe driving methods for local teens. Today, a percentage of the proceeds goes to local high schools with high participation numbers in the race for safe driving education programs. The remainder goes to the Christ Church Youth Ministry Endowment Fund, which grants funds and scholarships to Christ Church youth and young adults for community projects, events, and retreats. Friday January 11 4-7 pm at our race store sponsor Omega Sports at their North Hills location in Raleigh. You may have a friend or family member pick up your bib. Those who cannot attend the advanced check-in can check in on race day. Race timing is provided by Precision Race. See the schedule of events and event locations (including driving directions) Need to know when and were advanced check-in is held? Just check the app! See the list of registered runners to verify your registration Prior to the race, find your name in the "athletes" section and then connect the app with your social media. Your results can then be automatically posted to your Facebook wall and/or Twitter feed as your cross the finish line. Download the FREE app on your iPhone or Android. 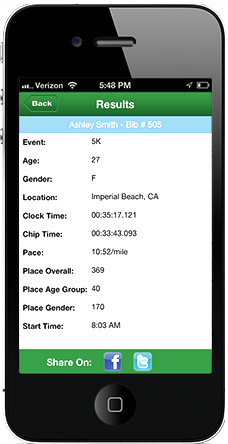 Once your install and open the app, simply search for "young" and select the Run for Young 5k. All awards are generously provided by Omega Sports, our running store partner. Additional awards are often provided by various other sponsors of the race and will be distributed to top male and female finishers. Top 3 overall male & female finishers. Door prizes from various local retailers are drawn as the race is completed. All registered runners, walkers, and participants are automatically entered to win through their bib number.